Decent enough filler, not too bad, certainly not amazing. I hope the finishes are of good quality otherwise this could look very cheap. wilkiebarkid;156663236 wrote: Recent image of this proposal. Plans are also on DAC expected to be approved on Thursday. Construction expected mid year. Site has been cleared. Ahh I'm such a blonde today. A development boss, whose firm is being sued for allegedly failing to prevent demolition disruption on a city project, has justified the inconvenience on neighbours, saying the work could not have been done with a “shovel and wheelbarrow”. 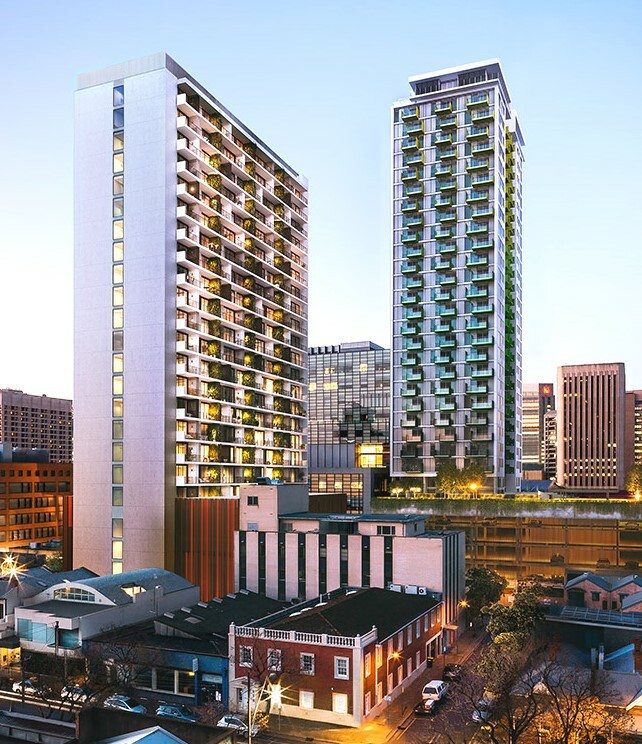 Carrington St-based Bar Chambers is seeking unspecified damages from Flagship Property Holdings and builder Maxcon, claiming they failed to “minimise harm” when demolishing a neighbouring building last year to make way for the 24-storey Penny Place apartment tower. Flagship chief executive Mark Jarman, told the State Commission Assessment Panel, which approved the $48 million apartment project last month, that demolition was in accordance with their contract. “I’m not sure anything was necessarily wrong (with demolition),” he said. He said the demolished building was “substantial” and made of reinforced concrete. “You couldn’t do it, with all due respect, with a shovel and wheelbarrow,” he said. He said he was unaware of concerns that contractors had worked before or after their permitted hours. In written submissions to SCAP, Bar Chambers and neighbouring business owners and residents raised concerns that demolition work was done outside approved hours and that complaints to authorities were ignored. Stuart Henry SC, representing Bar Chambers, argued before the SCAP that should the apartment be approved, it be done with strict and enforceable conditions controlling impacts from construction. He also called on the panel, as the approving authority, to take “ownership” of any impacts stemming from the development. The SCAP approves all projects valued above $10 million in the CBD, but managing environmental breaches is largely the responsibility of the council, which has three compliance officers. Adelaide City Council associate director of planning and development Shanti Ditter said complaints process for residents and businesses affected by major construction works was a “mess”. “There’s a lack of clarity which means no one knows where to go,” she said. The message here seems to indicate something about the legal fraternity and I wouldn't say it was positive. Overly precious comes to mind First we had the attempt to block Kodo because people would be spying on Federal Court business (lol) [from memory they tried to use the OLS-breach argument?] and now multiple attempts to dredge up every single possible issue to stop Penny Place. I know the self-myth of the legal eagles is that they are all doing hallowed and precious work (unlike everyone else) but if you are located in the city, noise and disruption is kind of given. Perhaps they should have considered relocating to chambers in Unley or somewhere in the Adelaide Hills if they wanted to remain in aspic. Plenty of small heritage buildings in untouched surroundings there. In the meantime, a huge tower is being constructed right next to the tax office and of course we have multiple developments going up around and near various hospitals in the city too. But who cares about those functions right? The showroom is now open to the public and can be seen on Angas Street where the former Kodo showroom was. Fit out looks really good. Not many apartment projects for sale at the moment and a couple that were have changed use such as Palladium and U2 so I'd expect this one will sell well. Haha yeh i'm looking forward to it. When its finished there will be a square between the two buildings with shops and cafes.